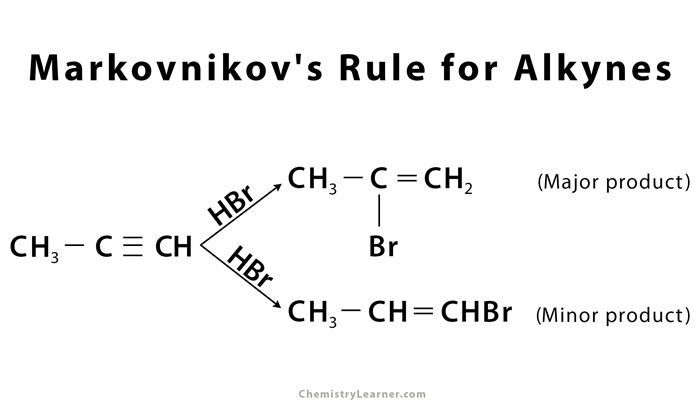 The Markovnikov’s rule predicts the outcome of addition reaction carried out on addition of protic acid HX to an asymmetric alkene, also called hydrohalogenation (under standard conditions). It was formulated by Vladimr Markovnikov in 1865 . When a protic acid HX (X = Cl, Br, I) is added to an asymmetrically substituted alkene, addition of acidic hydrogen takes place at the less substituted carbon atom of the double bond, while halide X is added to the more alkyl substituted carbon atom. In other words, hydrogen is added to the carbon atom with more number of hydrogen atoms attached to it and halide is added to the carbon atom with least number of hydrogen atoms [1, 2]. The driving force behind the reaction is the formation of carbocation on addition of H to the alkene, in the first step of the reaction . The most stable carbocation is formed when H is added to carbon having more number of hydrogen atoms already attached – due to factors like induction and hyperconjugation – which gives the major product with Br added to less hydrogen-rich carbon . Less stable carbocation (H added to less hydrogen-rich carbon) is also present in small quantity, forming minor product on addition of Br to carbon having more hydrogen attached . These reactions are the laboratory usages of Markovnikov’s rule and are used in a variety of chemical processes. 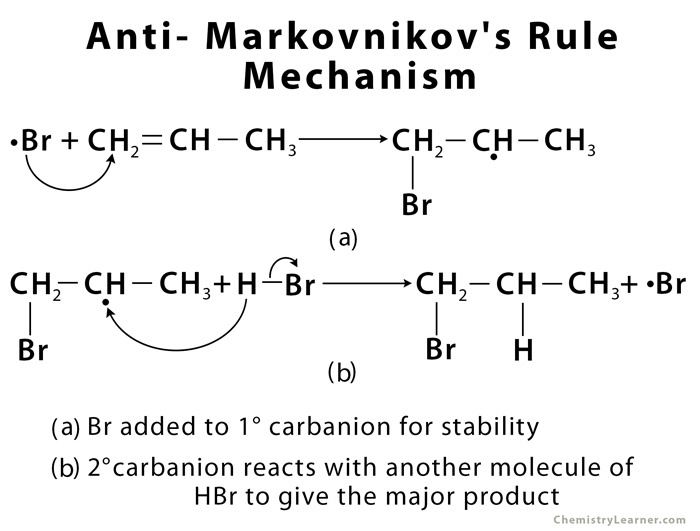 Anti-Markonikov’s rule describes the regiochemistry of mechanisms that do not involve the formation of a carbocation. Here the halogen adds to the less substituted carbon instead of the more substituted one, as is normally the case in Markovnikov reactions [1, 4]. 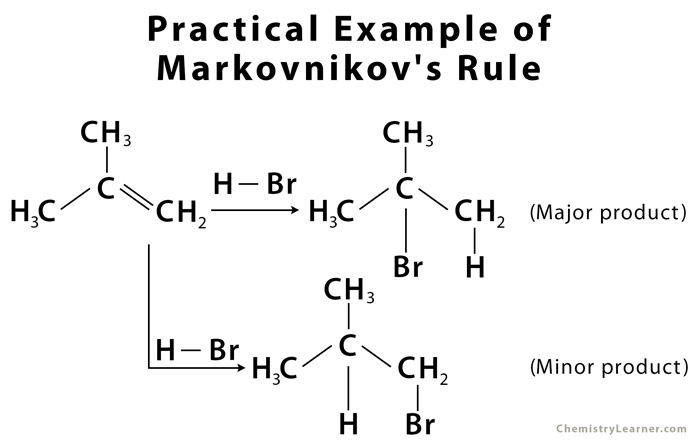 The most common type of mechanism for anti-Markovnikov reactions is that of free radical addition. 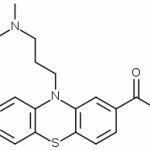 This mechanism is only applicable for HBr – not HCl or HI – with the presence of either benzoyl peroxide (C14H10O4) or hydrogen peroxide (H2O2) . Peroxide is essential as it acts as a catalyst which breaks HBr into Br and H radicals (a radical is any chemical species with one unpaired electron ). The Br radical attacks the alkene first. 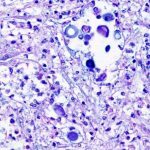 It attacks the less substituted carbon, as the carbon radical so formed will be at the more substituted carbon, for greater stability. The carbon radical then attacks the hydrogen of another HBr molecule, liberating another Br radical and so the reaction is carried forward [1, 4]. As with Markovnikov reactions, there are also trace amounts of product formed by the less stable carbon radical, with Br attacking the more substituted carbon . Again, the mechanism is applied in these reactions for a number of laboratory uses.